Hi everyone, I wanted to share with you a layout I did using some of the awesome, new products released at CHAW 2013. The paper is Vintage Modern. Gorgeous, rich paper colors are so easy to work with. Other products used were the new Rub-Ons (Canning Jar fun, Feathers ~gold and black). They applied so easily and look great!! The two Fiskars punches used were Jenni's Label ( she has her own punch named after her:) and Quilt Star. Just FYI~ many of the digital kits have punchables images. Just another reason to have all the punches! Calvinball is going on in the forum~stop in and check it out! Prizes and fun promised! So sweet!! 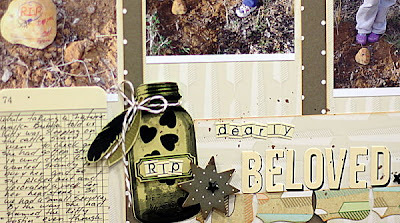 LOVING the jar and those feathers!!! Beautiful!!! Love seeing these products in action... Connie style! what a great LO!! Love the way you put elements together! Beautiful design, Connie, with the three panels and awesome embellishments! I love those adorable pictures and really love the layout.. Connie is amazing.. Fantastic layout Connie! Love how you used the punch! How cute is that jar accent, loving this! I love the design, colors, photos, and those punches. I have several Jenni/Fiskars punches. I guess I need to head out to JoAnn's soon.